Huge or tiny, globes look great and they are very inexpensive. They look terrific clustered together or you can use one large globe on the floor for a more dramatic look. If you can get your hands on a bunch of inexpensive globes, they are also great for DIY décor projects. You can cut them in half to make cute bowls or cover them in paint to create customized art. To get some more ideas, check out this Babble post. 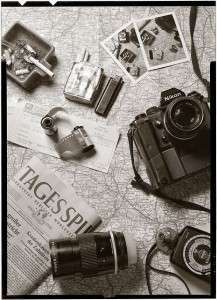 If you travel, what do you do with all the items you bring back with you? A great option is to display them. Group postcards and other treasures on walls, on a dresser, or on a side table. There’s no need to hide them away or let them gather dust. 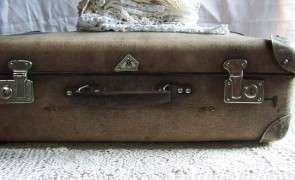 Most of us tuck suitcases away in closets or under the bed, but suitcases can be a great way to decorate and even add a little storage space to your bedroom. 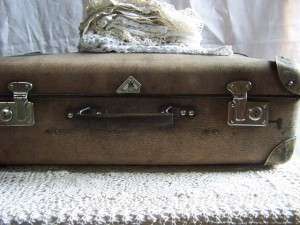 Look for vintage suitcases or suitcases you really like and stack them high, from largest to smallest. They look terrific and can store quite a bit. You can also create a stack of suitcases to serve as a nightstand by the bed. 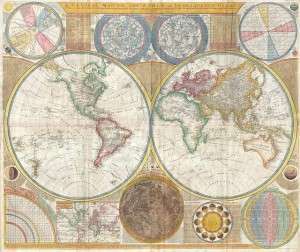 Furniture with a global feel. If you want to create an exotic look, check out bamboo furniture or wicker pieces. For a Far East look, add a few statues, a water fountain and plenty of throw pillows and rugs in jewel tones. Or, put a huge canopy bed in your room (or even a hammock) and top it all off with a huge mosquito net for a very Isak Dinesen Out of Africa Look. You can see more about how to pull the look off at this blog. 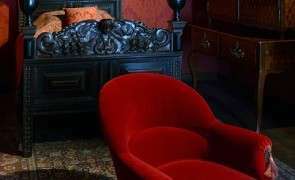 If European is more your style, local antique stores will usually have some older European pieces that can help you recreate the look of that Spanish hotel where you stayed last year or the Italian café you visited. The main thing with furniture is to stick with one theme and one look rather than mixing and matching styles too much. 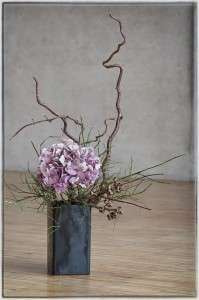 To get some more ideas for your room, check out this blog and this post. A well-traveled style looks amazing and is quite easy to incorporate in the bedroom. If you want to be dreaming of globetrotting adventures, a few tweaks can have you looking forward to your next vacation even more. This entry was posted in Bedroom and tagged bedding solutions on September 30, 2013 by A. Antonow. What will I be using my room for (besides sleep)? What did I first notice and like about my bedroom? What do I not like about my bedroom? What things in my room do I already have that I can use to create a different look? How much space do I have for what I want? Do I need to consider any specific needs (i.e. pets or children)? Who else will be using the room, and what are their tastes like? 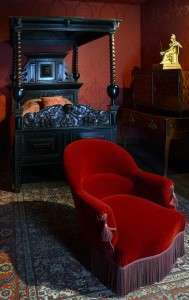 Am I drawn to modern rooms, traditional rooms, or another style entirely? Which colors make me feel most at home? What kind of sleep am I getting in my bedroom now? 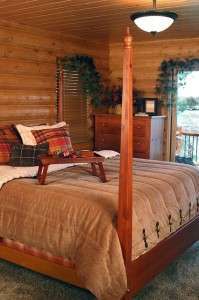 What is my morning and evening routine like and what can I do to my bedroom to make these routines easier or more pleasant? What bedroom have I liked sleeping in best? What did I like about the room? What feelings do I want to evoke in this room? If I could only change three things about this room, what would they be? How often do I want to change my bedroom up? Are there health concerns in my bedroom I need to address when decorating or making changes? What would my bedroom look like if money, time, and practicality were not an issue? These questions will get you thinking about what you want – and don’t want – in your new bedroom. They may also help you realize things that could affect your décor choices. For example, if you’re going to want to re-do your room often, you may want to buy less expensive furniture so that you can change it without feeling bad about the budget. To avoid disaster, plan on paper or online before you make any changes. Carefully measure your bedroom and any furniture you think you might keep. Then, consider different colors, styles, and ideas for your room. You can use online tools to get a sense of how the space would look like with specific changes, which is very useful when comparing styles and choices. You can see a list of online planning tools here. Renovating or making over a bedroom can be costly, especially if you want to make changes to your furniture and the structure of the room. Create a budget for your project. If you need help, there are online calculators here, here, and here. If your bedroom has good basics, you may find your job is much easier than you thought. Maybe you have a large closet, a decent solid wood bed, and attractive windows. Find ways to highlight what you love. For example, beautiful ceilings can be showed off with a light fixture. Rather than replacing everything, find ways to salvage what you own. If you have a nice dresser that is in bad shape, for example, you may want to repaint it and add new drawer pulls to create a whole new look. Don’t just reinvent the wheel – think about what already works and what can be make better with a little paint and imagination. Of course, some things will have to go – like the mattress that gives you a terrible sleep or the broken nightstand. This is where your budget comes in. Just be sure to use the money wisely – hunt around for quality items that you adore rather than settling on something that is just available. Unless you hire a professional, you will likely have ugly-duckling stages where your bedroom looks less than ideal. Maybe you’ll have trouble getting the paint right or will have to wait a few months to be able to afford a beautiful dresser. That’s OK. If you can’t afford gorgeous bed linens at first, for example, buy cheap bed-in-a-bag sheets and keep saving until you can afford the items you want. Once you have these in place, you can start thinking about accessories and additional items. You can add a pile of pillows to the bed, for example, plants, and art for the walls. You may also want to add a vanity area or a cozy spot for reading or relaxing. You may find the perfect canopy bed at an antique market one Saturday when you are more worried about your latest work project rather than the state of your home. Or, you may find the perfect armoire at a flea market one year from now. The point is, don’t focus on getting things perfect in your bedroom. Give your room permission to change and grow by seeing the makeover process as a journey rather than a perfect room that looks as though it belongs in a magazine. Don’t make design mistakes because you rush too fast into your bedroom makeover. If you’re handling the re-do yourself rather than hiring a pro, take the time to carefully consider and plan the project so that you get your dream bedroom with fewer mistakes and hassles. This entry was posted in Bedroom and tagged bedding solutions on August 31, 2013 by A. Antonow. The HiCan bed. This is more like a tiny futuristic sleeping pod than just a bed. In this bed, you can watch movies on the pull-down theater screen at the foot of the bed or play games via the integrated consoles or personal computer. 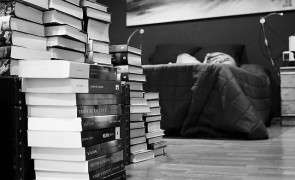 If you want to indulge in some low-tech book reading, there are integrated reading lights and shades that allow you to get a full lights-out effect once it’s time to sleep. You can find out more at the HiCan website here. The Bediator. If you live in a cold climate, you may appreciate this unusual bed. It acts as a radiator during the day and can be flipped down to a heated bed at night. You can see the futuristic design at the Yanko Design website here. Magnetic Floating Bed. Check it out here. This bed uses magnets to keep it afloat, although it can also be lowered to the ground. The Mobelform bed. The Mobelform bed is round and rotates so you can see the view out your window and then look at your TV with a simple spin. The Panasonic bed. Developed by Matsushita Electric Works, this bed monitors lighting, movement, sound, and air temperature as you try to drift off and automatically adjusts lights, TV, and music so you can drift off without having to turn anything off. In the morning, it turns everything back on again. 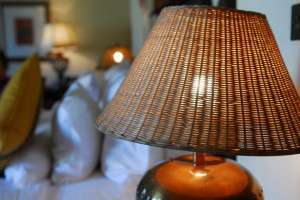 Prices for the bed start at over $12 000.
Who needs a traditional lamp with lampshades? Futuristic lamps involve sleek, unusual designs. For example, the Pouring Light Lamp by Yeongwoo Kim looks just like a cup suspended in mid-air, pouring out liquid. Stylish and sleek. To take a look at this and other lamps, check out The Fancy blog here. If you want something practical, consider the Senzo Nightlight, designed by Soledad Clavell and Marcos Madia. This long light is mounted mid-way up the wall and is activated by a simple touch. Do you dream of light sabers and laser beams? If so, you might appreciate the Draw The Lights lighting solution by Seo Dong-Hun. A network of LED lights is installed on the ceiling and you can use the light wand that comes with the solution to draw patterns of light on the ceiling, to make the lights dimmer or brighter, and to generally create the light you want. You can see the design at the Inhabitat blog here. You may remember glow-in-the-dark star stickers from your childhood, but if you want the more modern take, consider the Homestar Pro from Segatoys. This device projects an image of the galaxy on your bedroom walls or ceiling – perfect if you want the feel of the outdoors inside. If you like the idea of having a TV in your bedroom, the Samsung transparent TV looks like something out of Star Trek. Sleek and clear, it blends easily with any décor. 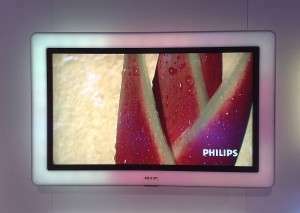 In screen sizes such as 46-inch (116cm) and 55-inch (140cm), the TV does not even need a stand. It can lean up against a wall. You can read more about it at the RedOrbit site here. Want to drift off to the sound of your favorite tunes? The iPod Speaker pillow comes with built-in speakers that can be hooked up to your favorite player. Find out more here. The Technogel pillow regulates temperature and molds to the shape of your head. 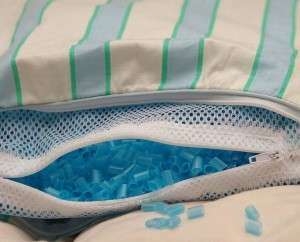 The blue design also looks great – even without a pillowcase. You can find out more about this pillow at the official site here. No matter how modern and comfy your bedroom is, you will eventually need to get up to face your day. 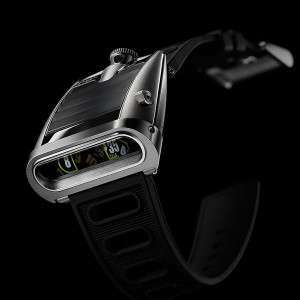 You could set your iPhone or other mobile device to wake you, but there are also other, more futuristic options. For example, the iQ Alarm clock requires you to answer trivia questions to shut the device off. 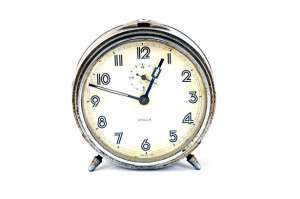 There’s no snooze button to turn it off – you have to wake up enough to answer questions. If you aren’t that awake in the mornings, you can try the flying alarm clock. A detachable helicopter arm flies away from the base when it’s time to wake up and you’ll need to catch it to turn the alarm off. You can take a look at this alarm here. If you are waiting for the latest eco-alarm clock, thinkgeek also has an alarm clock that runs on water (and other drinks – including beer). You can check it out here. A futuristic bedroom can look sleek and stylish. A few unique gadgets, cool colors, and spare furnishings can help create a modern look. As an added plus, some of the gadgets and innovations mentioned here can actually help you get a restful night of sleep. This entry was posted in Bedroom, Home Tech and tagged bedding solutions on April 30, 2013 by A. Antonow. 1) Change the placement of the bed. Where you decide to put your bed can affect quality of sleep. It’s also a very personal choice. 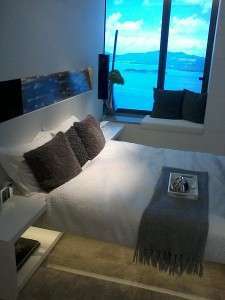 Those who believe in Feng Shui think that the bed should not be placed under a window. 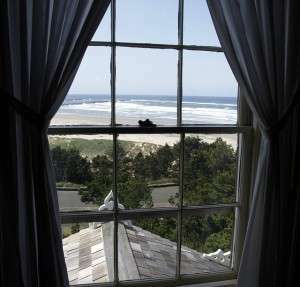 Others, though, like placing their bed under a window because they want a soft breeze wafting over them in sleep. No matter what your design philosophy, your bed is likely the bulkiest thing in your bedroom, so taking some time to find the right placement is important. Changing your bed’s position from one end of the room to the other will completely change the appearance of your room – and can change how well you rest at night. Most interior designers agree that investing in quality sheets and linens is a must in every bedroom – even if you have to save for a while to buy quality. Don’t buy discount linens in a bag. You deserve better than that. Cotton sheets in a solid color and with thread counts of 450 to 650 will give you the most luxurious experience. If you are on a budget but want the most luxury for your dollar, stick with sheets in the 500 thread count range. This is the sweet spot, those in the know agree. Sheets with higher thread counts than 500 are much more expensive but don’t deliver significantly more coziness. Avoid lots of patterns and embroidery, too, since simpler sheets will be easier to mix and match. If you are on a budget, price silk at your local fabric store and find out how much it would cost to have it sewn into sheets. 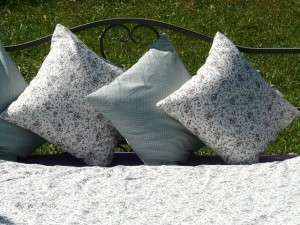 If you can sew or can have someone sew the sheets for you, you can create luxury-feel linens at a fraction of the price of designer cotton sheets. Be sure to top your sheets with a wool blanket, fluffy down comforter, or quilt. Stay away from cheap polyester throws and comforters – they’re not comfortable and they will look dingy very quickly. Of course, beautiful sheets will not make sense if you are sleeping on an old, cheap mattress. Compare prices and look for mattresses on sale, but invest in the best one you can find. We spend a third of our life sleeping, and sleeping on a bad mattress is a sure path to waking up with aches and pains. 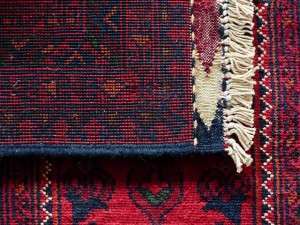 3) Add beautiful rugs to you r bedroom. Unless you have heated floors, your bedroom floors will likely feel cold on your bare feet in the mornings. 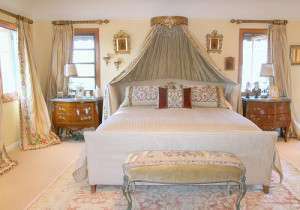 Invest in either quality carpeting or luxurious wool-silk rugs, which add a shimmer as well as comfort to any bedroom. Another option is sheepskin or shag rugs, which let your feet sink right into coziness first thing in the morning. 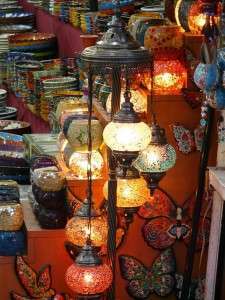 4) Add several lamps to your bedroom. Bedroom lighting is tricky. On the one hand, you want enough light to be able to read, but soft lighting is a must if you want a flattering, romantic bedroom. If you have the money, you can solve the bedroom lighting question by installing a dimmer. The simpler solution is to have several lamps around the bedroom, so that you can add more or less lighting depending on your mood. 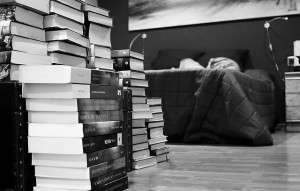 Overhead lighting should be only over a reading area (never over the bed) and you will want a floor lamp as well as bedside lamps to add a soft glow. You can opt for lower-watt light bulbs in this room, or you can paste gold paper inside lamp shades to create a more flattering glow with brighter light bulbs. Look for attractive lampshades. A budget-friendly decorating trick is to save money by buying low-cost lamp bases – either in a discount store or second-hand shop – and buying higher-quality lampshades. 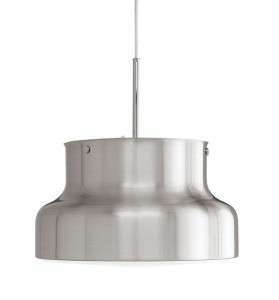 You can also create a more coordinated look by using the same style of lampshades on different bases. If you want to transform your bedroom, you can also keep the lamps you currently have and just switch up the lampshades to something in a stunning color. If the cost of lampshades is prohibitively high, consider making your own. Design Sponge has a step-by-step tutorial here. For a more dramatic look, DIY Craft has a guide to making gorgeous paper lampshades here. 5) Buy a headboard – or change up the one you have. A bold, dramatic headboard creates a backdrop for your entire bed area. 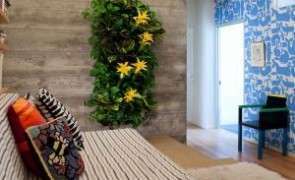 Headboards can cost hundreds or even thousands of dollars, so if this seems like a luxury you can make your own. Chris Prickett has a YouTube video here showing you exactly how to build an attractive headboard for $50. Remodelaholic has 25 DIY headboard projects here, and if you are looking for something different, be sure to visit Furnish Burnish here. They have a number of unusual headboard ideas that are affordable and gorgeous. 6) Shut out the world. If you really want to create a beautiful bedroom, you will need to make this room the one room in your home where the world does not intrude. Get rid of as many screens as you can. Certainly there should be no computer in the bedroom, but you may also want to get rid of the TV and any work-related paperwork. Devote your entire bedroom to relaxation. You may have some pleasure reading in this room, or soothing music, but overall it should be an escape from the world. 7) Transform your window treatments. Choose colors that work with the wall paint and your linens. Neutral colors and soft linen fabric work best, and if you don’t have high ceilings, consider floor-to-ceiling curtains to create the illusion of taller ceilings and to frame your view. 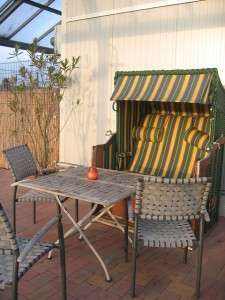 8) Create a seating space. An ideal spot is a little reading nook with a low-lying table and a soft chair or two. If you don’t have the space, even a padded chair can do. A padded bench at the foot of the bed is another option for very small bedrooms. Adding a seating area creates the illusion of a larger space and also gives you a spot to try on clothes or relax after a long day. 9) Personalize your bedroom with beautiful accents. Beauty can refresh your mind and spirit the way that sleep refreshes your body. Bring personalized accents and beautiful items into your bedroom so that you can look at gorgeous pieces when you go to sleep and wake up. A pretty painting (or print), a display of your collectibles, or even a jewelry tree with your favorite baubles can all create a beautiful mood. Pictures of your loved ones in attractive frames can also be something that can improve your mood in the mornings and can make your bedroom look more like your haven (and less like an impersonal magazine spread). 10) Don’t forget about scent. Bedrooms can smell stale quickly. Be sure to change your linens often and clean this room regularly. Air out the room often, as well, to get rid of dust and other allergens. Unless you live in a very cold or noisy climate, keep your window cracked at night to get fresh air; you will sleep better that way. Flowers and plants in the bedroom can help clear the air and can add a hint of fragrance. Scented candles, sachets, and diffusers are another way to add a hint of luxurious scent to your bedroom. Just be sure to read the ingredients and opt for the most natural products possible so that you don’t end up bringing pollutants into your bedroom. Harsh, toxic chemicals have no place in the room where you sleep. A good option is to make your own scented candles, diffusers, or sachets. It’s eco-friendly, affordable, and allows you to mix personalized fragrances. The website eHow has detailed instructions for making your own sachets and candles here and here. You can learn to make your own reed diffusers at the HubPages.com site. Your bedroom should be the backdrop for romance and relaxation. If it is outdated and boring, consider making a few changes to transform the space into one you will be happy to spend time in. This entry was posted in Bedroom, Decor & Style and tagged bedding solutions, how to on April 23, 2013 by A. Antonow. 1) Messing up the lighting. Lighting in the bedroom is tricky. If you read at night, you need a light bright enough for that. At the same time, though, you probably will want softer lights that can set a soothing stage for sleep and relaxation. Keep in mind, too, that too much light when you are trying to sleep can actually disturb your sleep and contribute to sleep disorders. The best option is to have dimmers or lights that have a few settings. You will also want a brighter light for reading and softer lights for just relaxing. Another great option is to look for softer pink lights – they will cast a soft glow over the whole room. 2) Not focusing on all the senses. A bedroom should appeal to all your senses. It should be attractive, have soothing music (and quiet for sleeping), and should be pleasant smelling. Choose attractive accessories, linens, and furniture for your room and use soothing music to create a relaxing atmosphere. Consider adding some diffusers or plants to the room to create soothing scents. Some scents, including lavender, are naturally relaxing and may even help you to drift off. If you have a small bedroom, you can still add some containers of plants if you get creative. For example, Woolly Pockets allow you to create gardens right on your wall. Find out more at the website. 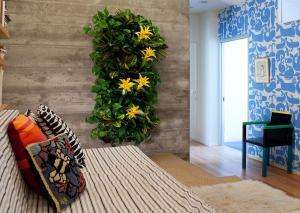 You can bring wonderful-smelling plants into your bedroom and create a great display. Plants can even improve air quality, so that you breathe easier at night. Many people decide to invest more in their living rooms, because that is where they entertain. However, you will spend more time in your bedroom than in your living room and the quality of your sleep can have a big impact on your health, so it just makes sense to put more money into your bedroom. Buy quality pillows, mattresses, and a good-quality bed. Invest in pieces that appeal to you and help you get a good night’s sleep. An unhealthy sleep means an unhealthy life, so make sure that you create a bedroom that helps you reach your health goals. Do you wake up tired, with irritated sinuses, or cranky? Consider whether anything in your bedroom could be causing you to get a terrible night’s sleep. If you have a space heater, for example, you may be drying out your sinuses. You can invest in a humidifier or you can switch to floor heating, which is a gentler form of heating. You can find out more about the health benefits at Warm Your Floor. To enjoy better health, you will also want to get rid of any harsh chemicals in your bedroom – and that includes harsh cleaning chemicals or chemical scent sprays. 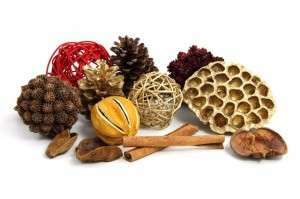 Food.com has a useful list of home-made cleaners and air fresheners you can make. You’ll save money and just may end up enjoying a better sleep. 5) Putting too much in the bedroom. Too many knickknacks, clothes, and accessories in the bedroom create a hectic and cluttered space – one that can make it hard to relax. Prune back what you own to create a more soothing bedroom. Now that spring cleaning time’s here, it’s time to reconsider the bedroom. If your bedroom makes you feel frazzled rather than drowsy, now’s the time to tackle the room to create a whole new oasis of calm. This entry was posted in Bedroom and tagged bedding solutions, useful tips on March 22, 2013 by A. Antonow.